I realised that the rainwater in our new plastic water tanks was acidic when I wanted to test our garden soil pH and I couldn't get the pH meter to work properly. I thought it was broken. I recalibrated it several times, and still it was reading below pH 5 on water from the tap. After some research, I realised that the pH meter wasn't broken, our rainwater really is that acidic. You've probably heard of acid rain. Rain absorbs gases such as suphur dioxide, nitrogen oxides and carbon dioxide in the atmosphere, which creates sulphuric, nitric and carbonic acids respectively. In concrete water tanks, the acid dissolves the lime in the cement and returns the water pH to neutral (7), but that's why concrete tanks usually end up leaking. Evidently a similar reaction occurs in rusty metal tanks, probably with the iron, as our water used to be pH 7 in the old tanks. In plastic tanks, there is nothing to react, so the water remains acidic. We live near a power station, which is a major source of these gases, so our water may be worse than others, although apparently it can be as low as pH 3 in heavily polluted areas. The main problem with acidic water, is that it can start to dissolve the copper pipework in our hot water system. To correct the pH, we needed to add some calcium to neutralise the acid. 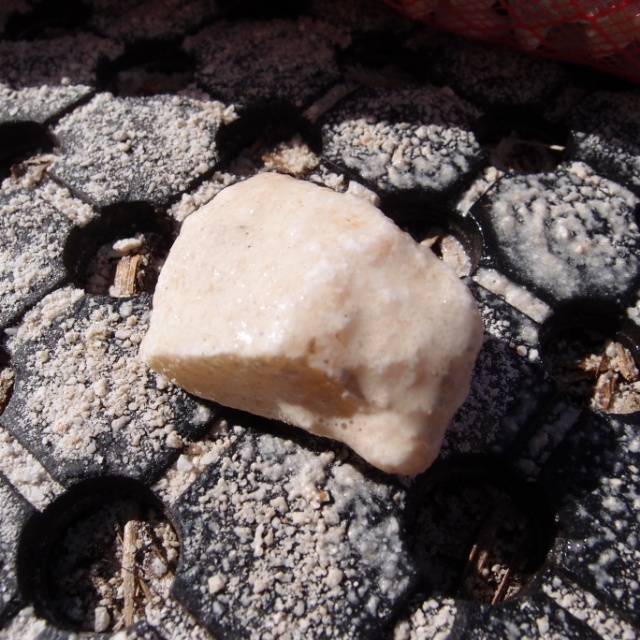 This is typically in the form of limestone or shells, that can dissolve gradually to correct the pH. When I posted this on facebook, I was warned about too much calcium causing deposition in our hot water system! When did rainwater get so complicated?! Fortunately, we have the pH meter and a conductivity meter (measures dissolved solids), so we can monitor the water and remove the calcium source before it could cause problems. If you are really worried about calcium deposition, you can use the Langelier Index. This says that deposition occurs at a pH equal to the equation A+B-C-D, the constants are in the link above. A is a constant for temperature (around 2), B depends on total dissolved solids (TDS is 0 in rainwater, so B=9.7), C and D are also the minimum of 1 for rainwater. That gives me an answer of pH 10. So as long as we keep the water below pH 10 we won't have calcium deposition. This did make me realise that we need to be able to remove the limestone when the pH is just above 7, so it doesn't keep creeping up. It took me a little while to find limestone. Eventually I went to the local landscape supplies centre and asked for a few scoops of "white rock" which I was pretty sure was limstone. To check if I bought the right rock, first I sprayed a rock with vinegar, and it bubbled, probably limestone. Then I put a bag of the stones in a bucket of our water and tested the pH before and after 24 hours. The pH changed from 4.9 to 9.7. So I was pretty convinced that I had limestone. You can use these tests to check if you can't be sure what you're buying. 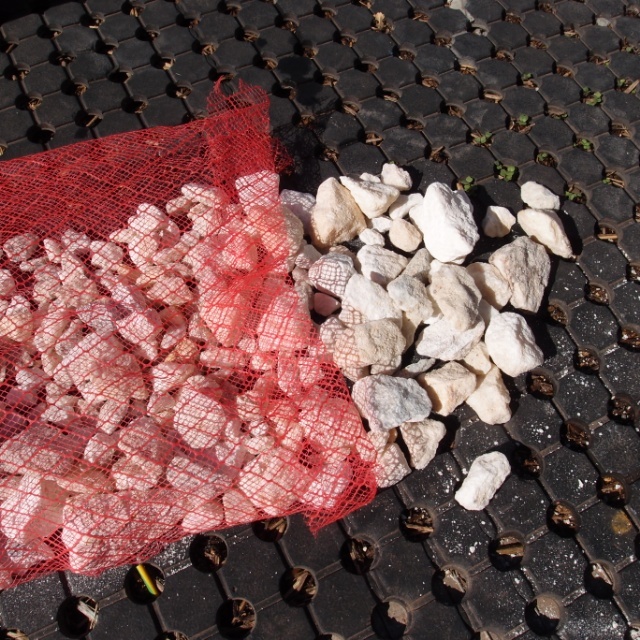 I then put some stones in onion bags, tied them up with bailing twine. Pete helped me to hang one in each tank. Pete then tested the pH of the water each day and watched it gradually increase. We agreed that we would remove the bags when the pH reached 7, as there was no reason to let it increase any further. Three weeks later, the pH is gradually increasing, but still not quite 7 yet. When we get there, we plant to put the bags in the strainer so that the rainwater washes over the limestone as it runs into the tanks. We will continue to test pH after big rain events and put the bags back in the tanks if it gets low again. Do you collect rainwater? Ever thought to test the pH?